Spy Fancy Lamp Hidden Camera with Recording, The Fancy Lamp Hidden Camera DVR is the most covert spy camera on the market! Looks just like a regular FANCY LAMP, but inside is actually a self-recording high-res camera that records amazing high-resolution real-time video at 1280x960 resolution! The unit is powered by the wall outlet, so there are NO BATTERY LIFE CONCERNS to worry about. This is an all-in-one recording plug-n-play video recorder - just plug it in the wall, and it starts to record when it detects motion. 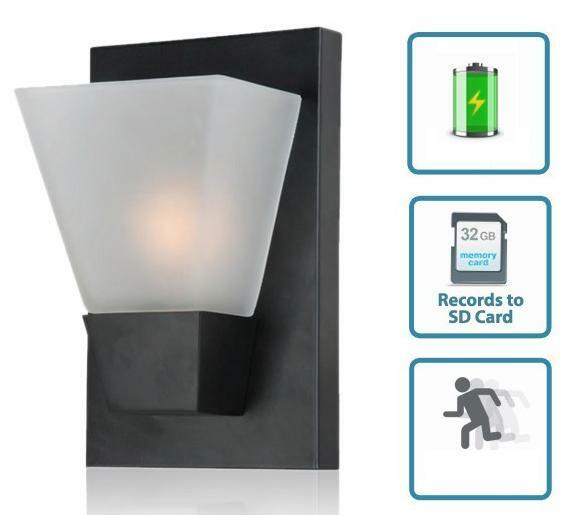 There are no confusing options to configure, or settings to set up, you can literally take the FANCY LAMP Hidden Camera out of the box, insert the SD card, plug it into your wall, and start recording! Quite possibly the easiest-to-use hidden camera ever. Powered by any standard outlet so you'll never have to worry about battery life. The FANCY LAMP Camera records in amazing high resolution 1280x960 video at 30fps. Simple to use - just plug it in and it's ready to start recording! Video is recorded to hidden SD card (32GB max) so files can be played back on any PC or Mac. ELITE model also has embedded time/date stamp so you know exactly when your video was recorded. Completely covert and hidden - no lights, beeps, or anything to give away that this is a camera. Get lifetime technical support from our experienced product experts if you ever have any questions.